Double Hollyhock | Henry Field's Seed & Nursery Co. 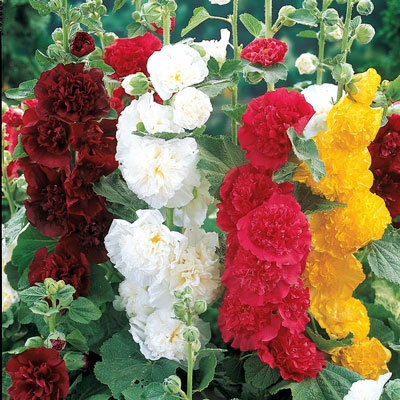 Colorful, ruffled double flowers in pink, apricot, violet, purple, scarlet, white or yellow bloom on sturdy, 4- to 6-ft. spikes. Adds old-fashioned cottage garden charm. Bloom from midsummer to early fall. Plant in full sun. No. 1 bareroot. Height 5 - 7 feet. 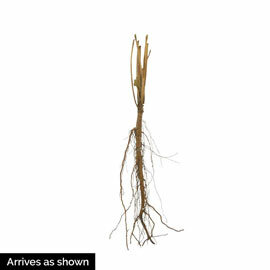 Depth: Place root system just under soil surface. Color: Mixture (Pink to dark red, yellow, and cream) Our choice of colors. Foliage: 5 - 7 sided, large rounded, dull green leaves. Blooms: Mid-Summer for 4 - 6 weeks. Blooms with: Four O'clocks, Dianthus, Coreopsis. Flower Form: Dense, double flowers borne singly on tall stalks. Soil Requirements: Needs constant soil moisture. Too wet or too dry causes weak plants. Fertile soil, with occasional applications of fertilizer. Pruning: Deadheading wilted flowers will encourage reblooming. Trim back spent flower stalks in late Fall or early Spring before new growth starts.